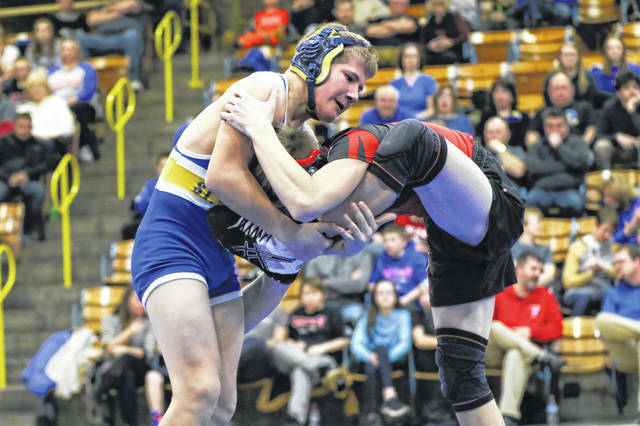 Mason Vanderwell of Delphos St. John’s competes against Spencerville’s Jay Goetz during Tuesday night’s match at Delphos St. John’s. 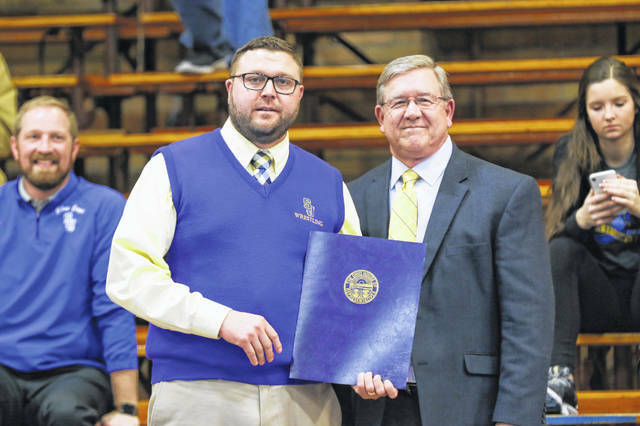 State Rep. Bob Cupp, right, presented an Ohio House proclamation Tuesday night to Delphos St. John’s head wrestling coach Derek Sterling as the program marked 50 years prior to its home match against Spencerville. DELPHOS — Gary Holdgreve admits that he didn’t know exactly what he was getting into. Back during the 1968-69 school year, Samuel Brewer decided he wanted to start a wrestling program at Delphos St. John’s. Now, all Brewer had to do was find some volunteers. Holdgreve, a senior at the time, was one of those volunteers. Now, 50 years later, the St. John’s program is still going strong. Tuesday night, many past St. John’s wrestlers, both young and old, gathered at Robert A. Arnzen Gymnasium to celebrate 50 years of St. John’s wrestling. Rep. Bob Cupp was in attendance to read a proclamation from the Ohio House of Representatives to the St. John’s program. After the ceremonies, St. John’s took on Spencerville. The Blue Jays, quite fittingly, defeated the Bearcats 33-15. Holdgreve said he quickly found out how challenging the sport of wrestling was. “Coach Brewer taught Algebra, I think it was. I was in his class,” Holdgreve said. “He said he wanted some seniors; and there were three of us that came out. We got on the team. We practiced all the time. We really didn’t have any real matches or anything. We had a few scrimmages and that was it. “I was a farm boy. I didn’t play any sports; and they just needed some seniors. So, we decided to do it. We did a lot of running up and down all of these steps (in the gym). … I do know that,” he said with a smile. Holdgreve said Coach Brewer knew how to wrestle. “I’m pretty sure he (Coach Brewer) graduated from Ohio Northern. He was a good wrestler. And man, he would take us all on,” Holdgreve said. Holdgreve said there wasn’t much emphasis put on ‘cutting weight’ back then. “I wrestled at 175 (-pound weight class). Back then, they were really lenient (on making weight). We had a bunch of scrimmages. We just wanted to get the younger kids going a little bit,” he said. For former St. John’s grappler Wes Buettner, wrestling has always been a huge part of the Buettner family. Buettner was a Division III, 2015 state runner-up at 195 pounds. He also was a state-qualifier his junior season. “My Dad (Keith) wrestled,” Wes Buettner said. “My Dad’s brother Will, who was on the original team, passed away. My brother Will also wrestled; and he’s actually named after my Uncle Will. And just like the Buettners, it’s always been a family affair for the Vonderwells. Brett Vonderwell, a Division III, 2017 state runner-up at 170, said wrestling was a way of life. On this year’s St. John’s roster, there are two more Vonderwells – freshman Mason (145) and senior Trent (220). Derek Sterling, the current head coach for St. John’s, placed fifth at the 1997 Division III state tournament at 152. Now, in his 10th year at the helm, Sterling really appreciates the rich history of St. John’s wrestling. Hidden in Tuesday’s celebration was the dual match with Spencerville. And to make the occasion even more special, St. John’s senior Justin Wieging notched his 100th career win Tuesday night. His father Kevin (1992 graduate), also wrestled for St. John’s. This entry was tagged delphosstjohns, Spencerville. Bookmark the permalink.